Since finishing the sweater and the shawl, I've been a little aimless when it comes to knitting projects. The Tour de Fleece starts Saturday, so I haven't really wanted to start a big project that will then be neglected for the next month. First I knit a couple of dishcloths because the ones we've been using in the kitchen are looking a little shabby. Then I pulled out the Shur'tugal Socks that I started on the way down to MDSW and have been working on a little at a time since then (the first sock is done through the gusset decreases). I couldn't resist the urge to start another sweater, though, so I decided that if I was going to start something headed into the Tour de Fleece, it should at least be something in handspun. I pulled out my oversized skein of All Spun Up Polwarth/silk from the very end of last year and wound it all into one very large yarn cake. Over the last two evenings, I knit up a swatch for the Breezy Cardigan, a lightweight version of what has become my favorite handknit sweater. With size 4 needles, I got nearly perfect gauge -- 24 stitches and 37 rows (pattern calls for 24 stitches and 36 rows). I have the day off tomorrow, so I'll be planting myself on the couch at my LYS for most of the day and casting on. I will need to pick up some ChiaoGoo Red Lace needles, though. I used my trusty Addis for the swatch and they are just not pointy enough! *If you know the score of Fiddler on the Roof as well as I, then I'm sorry for the earworm. My most recent FO defies all logic. Logically, I shouldn't be knitting a sweater when it's 90 degrees outside. Logically, when I'm effectually a single parent because the Mister is traveling for work, I should have less time to myself and therefore less knitting time. Logically, a sweater should take me at least a month to make. This was a really fun knit that went surprisingly quickly. Even given that it's worked in the round and is mostly stockinette, I'm still a bit shocked at how fast it went considering that my crafting time has been fairly curtailed of late. Because this was a test knit, I really did not make any major modifications to the pattern. I figured that adding some additional length to the sleeves was acceptable, and the designer had okayed my use of a larger needle for the colorwork band on the body. She noted that she hadn't included this needle change in the pattern because she was counting on the colorwork band adding additional shaping under the bust; as you can see, though, it doesn't quite hit that area for me! I'm pretty happy with the fit of this. I knit the size that gives me about two inches of negative ease, as recommended in the pattern, and I'm fine with that everywhere but in the belly, where I'm still carrying a bit of postpregnancy pooch. I guess this is good motivation to work on toning that area up! The sleeves are surprisingly comfy; I've realized that while I like negative ease in the body of a sweater, that sometimes translates to sleeves that are uncomfortably snug. These are snug at the wrists, where you'd expect them to be snug because of the ribbing and colorwork, but are well proportioned everywhere else. The pattern is well written, and the sweater is obviously really cute (and fast to knit -- have I mentioned that? ), so keep an eye out for it on Ravelry! I've mentioned the fiber I was spinning for a friend at least a couple times (remember, the stuff that was turning my fingers black?). Well, I've finally finished it. The second skein was completed Friday night and skeined and washed yesterday morning, and today I have two dry skeins ready to be delivered to their owner. One skein obviously behaved better than the other when it came time to twist, as you can see. Surprisingly, the yarn doesn't seem to have changed color much with washing, though the water was a bit cloudy when I drained it. Some VM did come out as well, but there's still a fair bit in there that I just could not pick out easily. The finished yarn looks to be in the sport to DK range; to be perfectly honest, this is not the most consistent yarn, mostly due to a less-than-stellar prep, and because of the large quantity of it (and the fact that I just wanted it to be done), I did not take the time and care to make it more consistent. As a result, there's a bit of thick-and-thin action going on here. All told, there's a total of about 550 yards in the two skeins. If I had to guess, I would say this was a meat breed and someone decided to try to make a little extra cash by selling the fleece as well. The prep was very odd -- the fiber was wrapped around itself in a flattened ball, but the strip of fiber itself was very wide -- and it was full of VM, much of which I either pulled out or fell in my lap while spinning. It was not a particularly pleasurable spin, but fortunately my miniSpinner made quick work of it. I was very happy to get it off my wheel before the start of the Tour de Fleece begins. 196.45 oz. unspun -- does not include fleeces! If I have one real creative weakness, it's naming things. This has always been the case. Way back in middle and high school when I did a lot of creative writing, titles were always my downfall. I could write something, revise it several times, and have it be completely to my liking, but it would take me forever to settle on a title -- and I'd rarely be satisfied with it. The same can be said for the shawl pattern I'm nearly finished writing. The sample is nearly complete, as you can see, except for the last of the border, and the pattern is mostly written -- mainly there are just a few holes to fill in, and I need to finish the shawl to do that (final dimensions, how much yarn I used, etc.). The only thing that's really escaping me at this point is a good name for it. I had a working name in my head for a while, but as it turns out, the word I was thinking of using doesn't mean what I thought it meant, so that name is out. I've done some Googling for words that seem to describe the characteristics of this shawl but have come up empty. I guess at this point I'm just waiting for inspiration to strike -- but given how soon this shawl and the pattern will be ready to go, I'm not confident that that's going to happen in time. Here is where you come in. I need some ideas or a name -- or at least some ideas that get me thinking enough to get me to a name. So I thought I'd make a little contest out of it. Here's how it'll work: You suggest a name (or multiple names, if you like, but I'll only count one entry per person). If I pick your name, or if your suggestion proves to be the inspiration that gets me to the final name, you win a copy of the pattern (or, if you prefer, a copy of any of my other patterns). I'll also do a random draw of all entries to win a copy of the pattern. Sound good? Here's what you need to know: The shawl is worked from the top down with two colors, and the stripes are asymmetrical but balanced so that the shawl itself is symmetrical (i.e., it's an isosceles triangle). It's in garter stitch, and there are short rows involved. Let's set an end date for 11:59 p.m. on Saturday, June 30. I'll announce the winners as soon as possible after that (it might take me a day or two to think through names). Ready? Set? NAME THAT SHAWL! Once I emerged from my medication fog and got Rainbow to bed last night, I managed to sit down with my second sleeve and finish it, so tonight I am ready to join the body and both sleeves and begin the yoke. I am anticipating that the first handful of rounds are going to be tough with so many stitches on the needles. I just have to keep reminding myself that there will be fewer stitches with each decrease round/row and that it's going to get faster in addition to more comfortable the farther I get in to the yoke! Ideally, I'd like to finish up the sweater this week, but I know that may not happen. My goal is to at least get it done before the start of the Tour de Fleece next Saturday (June 30), because then it will be all spinning, all the time! Of course, it would make perfect sense for me to finish it this week -- it's supposed to be in the 90s for most of the week, starting tomorrow! Before I begin, let me preface this by saying that I'm battling a sinus infection and the medication I'm taking is making me a little spacey, so please forgive me if something I write today doesn't quite make sense. Looks like I will get at least two, maybe three, decently sized skeins of yarn out of all these singles. I am very interested to see how they will wash up, especially considering that the fiber was turning my drafting fingers black as I spun. I have no idea why, but whatever that was is bound to come out in the wash. I'm sorry for the unintended radio silence on the blog this past week -- the Mister's been traveling for work and I've not been feeling well, so it was the kind of week where, once Rainbow was asleep, it was all I could do to turn on the TV and knit some stockinette in the round. The sweater has made good progress as a result, so expect to see some more of it in the week ahead! You would think that as the temperature (and humidity!) rises outside I'd be less inclined to work on a wool sweater, but in the last week I've found that I've been pretty addicted to working on my test knit. Stockinette in the round is just so easy and mindless, so without even noticing, I find I've knit several inches in one sitting. Last night I finished the last set of back decreases and got within about an inch of the colorwork section on the body. I should get into that tonight. The contrast color I picked is a dark gray/brown that I believe is leftover from the Mister's first Seamless Hybrid. (Four-and-a-half-year-old yarn -- how's that for stash busting?!) I weighed what I had left and came up with 46 g of the original 100, so about 100 yards. I think that should be plenty; if it's not, well, I'm going to have to rip and do some more stash diving. Worst case scenario, I'll pick up another skein of 220 at my LYS this Friday, when I'll be taking a day off from work and parking myself on the store's couch. I anticipate that a lot of the sweater will get finished that day. 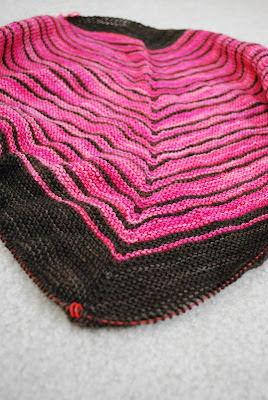 I'm also finally on the border of my shawl, which is pretty mindless but not very fast because of the length of the rows. I've been getting in some time on it every day during my lunch break, so I may actually have a finished shawl by the end of the weekend. Then I just need to type up the pattern and take some pictures to get it ready for tech editing and test knitting! A couple of weeks ago, my friend Colleen came over to spin for an afternoon. I decided to get out my long-neglected Lendrum and the March shipment from the Crown Mountain Farms fiber club. This fiber was CVM/Romeldale top in a colorway called Tiamat. CVM stands for California Variegated Mutant; it's an American breed of sheep known for its wide variety of color patterns in its fleece. Other than a tiny sample I used in a spinning class a couple of years ago, this was my first time really spinning this breed, and I quite enjoyed it. It's a very spongy, elastic wool, and the finished yarn has a lot of spring in it. I split my fiber up for a traditional three ply. The finished yarn is roughly sport weight and approximately 252 yards. There's lots of elasticity in this skein -- I can stretch it out several inches in each direction! There's one more spinning goal before the Tour de Fleece: finishing the mystery wool for my friend. I'm hoping to get the second bobbin done today! After swatching a second time (successfully, I might add), I cast on for my test sweater last night and got through roughly half -- about an inch and a half -- of the ribbing before it was time to call it a night. It's been a while since I did a sweater in the round (or, for that matter, one in regular old Cascade 220), and I'm rather enjoying it. The first couple of rounds are a little slow going because the stitches really have to be coaxed to move around the needle, but after that it's pretty much smooth sailing. I think I may take tonight off to ply up some handspun, but this sweater is going to be my go-to project for the next couple of weeks (the shawl has been promoted to lunchtime knitting in order to get it done). I have two days off from work this month that I'd planned to spend at my LYS, so I can see the sweater getting done in no time -- probably just in time for a major midsummer heatwave! Remember how I was saying that I had the urge to cast on for a sweater? As luck would have it, I was trawling through the Free Pattern Testers group on Ravelry (I like to see what other people are doing) and happened to spot a test for this sweater that had just been posted. After considering for a second or two, I signed up. I can totally knock out a stockinette sweater in the next month or so, right? I'm using Cascade 220 that's been in my stash for at least four years -- I bought it at the Pittsburgh Knit and Crochet festival the last time I went (which was definitely before we moved into this house). I can get Cascade 220 in every shade at my LYS, but the vendor I bought it from was a yarn store going out of business, so I got a steal: eight skeins for $40. Five of the eight were this pretty shade of blue; two were in a different blue and one was a greenish tan color. I'd originally intended to use them all in a sweater with some sort of colorwork yoke, but obviously the colors have never called to me over the years and all eight skeins have been sitting untouched in the back of my stash closet. I swatched with US 7s (the size called for in the pattern) last night and dutifully washed my swatch, and it appears that over the years I have loosened in my knitting. Looks like I will have to go down to a size 6, which is actually my preferred size for knitting worsteds that are on the lighter side, like 220. 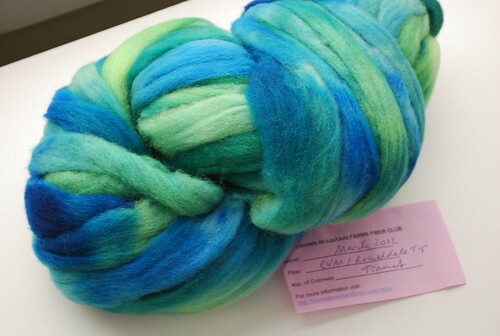 I am going to try to finish this up before the start of the Tour de Fleece, when I'll want to spin all the time. I don't think that should be that big of a challenge considering that (a) it's in stockinette in the round and (b) I have two days off this month that I planned to spend at my LYS knitting. I also really need to finish up the sample for a shawl I've been designing. I am nearly to the end, and really all that's left to figure out is how big I can make the border with the yarn I have left. Finally, as an aside, remember all that knitting I did for Mad May? Seems it was worth it: This morning I logged onto my computer to the lovely surprise that I won (by way of a random number generator) first prize in the General Wee Ones knitalong! I guess I really should have played the lottery yesterday as well. Last Sunday, my friend Colleen came over to do some spinning. We set up in the family room, where there's not an outlet conveniently located for my miniSpinner, so I thought it was a perfect opportunity to reacquaint myself with my beloved Lendrum (which has been sorely neglected in the past six months or so). I decided to pull out the March 2012 shipment from the Crown Mountain Farms fiber club, CVM/Romeldale in a colorway called Tiamat, and spend the afternoon starting to spi it into a traditional three ply. As soon as I can get the mystery wool off the miniSpinner, I'm going to use it to ply this up -- I have a feeling the finished yarn is going to be poofy enough that it won't fit nicely on a Lendrum bobbin!